It has been almost a month since I last visited the temperature plots, last looking at Pennsylvania and I have been debating a little as to which state to look at next. The reason for this is that one of the more logical choices, New York State, is one of those states whose stations do not appear on the truncated station list that Chiefio has found that GISS is now using. Which, given that one of the original questions was to look at the difference between the GISS data and that of the USHCN, makes that task, this week, unachievable. 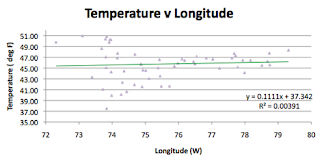 However it is still possible to look at the influences of temperature across the state, and to compare the raw data with that after it has been adjusted, and so with I am going to proceed with that effort. As usual I am writing this as I carry out the exercise, and thus initially discover that there are 57 stations in the state with USHCN data. There will be a pause while I download this, and the related station data. 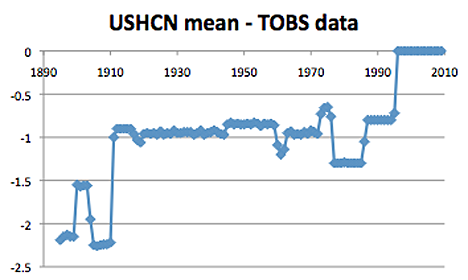 . . . . Well that took a little longer than expected, though it dawned on me half-way through that I could download both the USHCN homogenized average and the Time of Observation corrected (TOBS) otherwise Raw data at the same time. Putting these numbers together showed an apparent pattern of adjustment, that I will exemplify and discuss at the end of this post. Getting the population of the different communities required a little bit more detective work, given that there were three communities that I ended up attaching to nearby towns. One being, for example, Glenham, which I attached to Beacon. Another was Lawrenceville which was very close to North Lawrence. The third was Mohonk Lake, which sits in a larger community of 17,435 though it could be considered smaller, depending on the net you cast. Putting all those together and plotting both the homogenized data and the TOBS values gave a somewhat different view of actual changes. 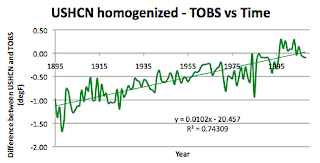 For example, while the TOBS data showed a temperature rise, on average, of some 0.5 deg over the 115 year period, the homogenized data showed a rise of 3 times that rate. 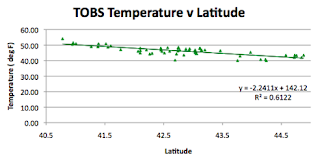 (I will generally only show the TOBS values plotted – though have the others for those interested). Looking at the geographic dependence, the relationship with latitude remains strong, if not quite as good as in other states. 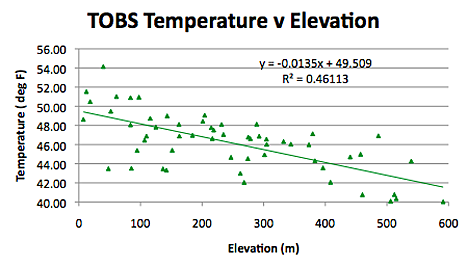 (New York has a much greater range of elevation than some of the mid-Western states). 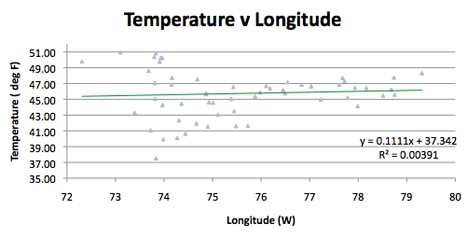 And the second is the plot using the homogenized data values. The state stations range in elevation from virtually at sea level to over 500 m and though there is more scatter than seen in other places, part of this may also be the influence of the nearby water. Looking at population, the logarithmic relationship that seems to come and go in the different states, is much stronger here than in some other places. 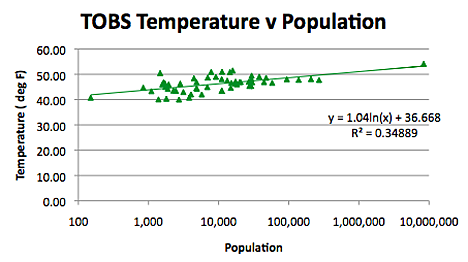 (And much better with the TOBS than the homogenized – R^2 being 0.129 in the latter case). There is some significant difference between the correlations using the slightly modified raw data (merely adjusted for time of observation) and that homogenized to give the accepted mean temperatures for the stations. The change is beginning to show a consistent pattern across the states. 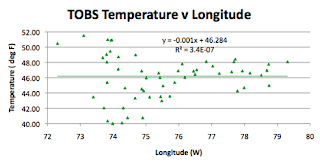 For New York, when the average temperatures as homogenized have the TOBS value subtracted, then a reducing negative adjustment with time to the average temperatures is seen to have been applied to the data. 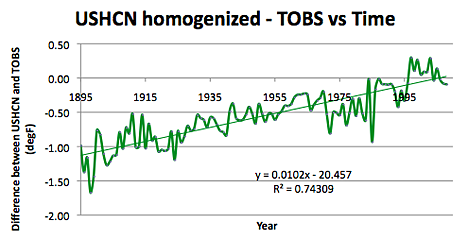 Difference between the homogenized data and the TOBS data for average temperatures in New York. Modification to the original data to obtain the mean temperature reported for Central Park in New York. 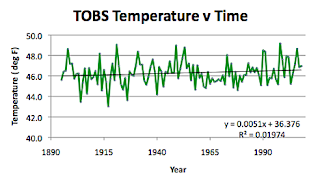 It is becoming a little strain on credulity to believe that all the temperatures around the United States that were measured back about a hundred years ago were consistently too high, and this measurement error has slowly and consistently diminished over the years. However I have only plotted the data for the last three states (though have it for the others discussed, I just haven’t made the plots yet). So at some stage I will make those plots, as we continue looking at the individual state data. Whither next? Hi Dave, is there any literature supporting these time-dependent downward adjustments? The procedure that is used has been described in rough detail at the USHCN website . I wanted to get enough information and enough data plotted that I could evaluate their "averaging" procedure. I think I am just reaching the stage where I can begin to draw some conclusions, though will keep going through the rest of the states to make sure that they are valid. There is a lot of room for debate about temperature adjustments, since we can't go back in time and remeasure. One of the issues has been the "warming" of Siberia, which apparently has been a major contributor to the 20th Century kinda-sorta global warming trend. There were few temperature records in Siberia at the beginning of the 20th Century, so those few stations have had a big areal impact. Turns out that the early 20th C temperature stations in Siberia were mainly in prison camps -- first run by the Czars, then later by the Communists. One theory is that the old thermometers for all the prison camps came from the same miscalibrated batch which gave lower-than-actual temperatures. 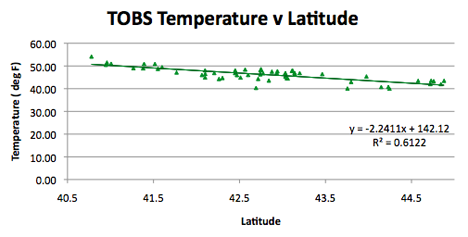 Another theory is that prison commanders deliberately reported lower-then-actual temperatures, since lower temperatures would have garnered extra supplies for the camps. Either way, there are possible systematic errors in long-ago records which can not be definitively resolved today. What HO is doing is great -- bringing adjustments to the measured values in the US into the light of day, which is the first step towards assessing the plausibility of those adjustments. The Chilean mine rescue continues with 4 men out.